Web Design that Drives Action. We approach website design and online brand experiences with a mission to convert. Thinking like your customers is the place we start, following their thought trail that lands at a decision point. That's how we leverage your website to be a growth-driven customer acquisition tool rather than static brochureware. XXIIBrands is your go-to Dallas website design company. We work with a range of clients that are making an impact, and awesome in their own way. We help them build a strong brand identity using website design solutions in Dallas, Texas. Our goal is to help forge a solid connection between our clients and their ideal audience. Our passion to help businesses grow is what fuels our every effort. Come to us for web design services in Dallas, TX. Our team has extensive design knowledge and experience to update your website and make you more attractive to your target market. Our Dallas web design agency’s knowledge of the rules of good design and ever-evolving web design tools don’t just make your website look great, though. You'll also feel confident about your new direction because our design team works with your business growth in mind. Why look for other Dallas web design firms when you have us? Get in touch with our team, today, and let’s find out how compatible we are. XXIIBrands is your dependable Fort Worth web design company. We recognize the importance of effective design to your overall business growth. Let’s talk about your web design needs in Fort Worth, Texas. You might not be getting great results online, even though you offer the best products and services in the market. Maybe you don’t have an enticing online presence for your brand. Fort Worth website design may be the final puzzle piece that you need to reach your business goals. Your current website may be a stumbling block to your ideal audience's perception of your brand. We’ll change that by listening to what your target market wants, and considering the modern effective design trends. From there, our website design company in Fort Worth will come up with the most suitable solution for you. We’ll make sure our plan brings you closer to your business goals. Talk to us about Fort Worth web design to boost your business growth. Wanna know how your website is doing? We work on website design projects with clients that have a need for increasing brand exposure and communicating with confidence. Every project is a bit different, but the overall mission is the same: defining your audience and speaking clearly to them. XXIIBrands wants nothing less than the best for our clients. And because we know that you must always be at your best, we provide web design solutions that make your website stand out. Our designers use reliable tools and innovative techniques to give you a site that encourages customer interaction and influences conversion. What Tools Help Create Effective Web Design? The digital marketing industry is constantly evolving and that influences the tools and techniques used for web design. For example, Adobe Photoshop, WordPress themes, and Chrome Developer Tools remain popular among designers. But, new tools with simplified graphical interfaces and artificial intelligence, such as Sketch and Canva, are also gaining attention within the industry because of their ease-of-use for the non-technical user. Our agency continuously scans the horizon for the latest tools and trends, and utilizes those that might benefit your web presence the most. What Are the Benefits of Web Design Services? Consistency of Brand Identity: Professional web designers create a consistent visual language that carries over from your website to other marketing tools, such as your brand logo, business cards, and even social media profiles. Distinction from Competitors: Unique web design lets you stand out from the generic web layout of competitor brands that offer products or services that are similar to yours. Objective Point of View: You may have an idea of what’s best for your business, but our web designers have an objective perspective that lets us determine the most practical and suitable design solutions for your site. An objective and consistent brand identity helps your ideal audience distinguish you from your competitors as they become more and more familiar with your brand. This way, your potential customers are more likely to go to you for the products or services that they need. At XXIIBrands, our web designers are focused on helping you experience significant returns from our services. We combine battle-tested methodology with the latest creative trends to make your website look its best. As a result, we get you one step closer to your business goals. Give us a call today, and let’s discuss your web design needs. Get Started on Your Inbound Marketing Strategy here. 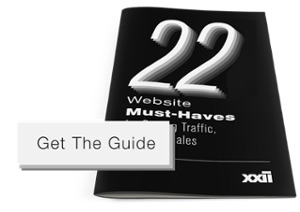 Download our free guide to learn about the 22 Website Must-Haves for Driving Traffic, Leads & Sales.